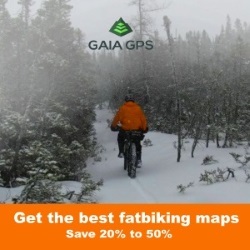 The attraction of fatbikes to most people is that they are fun to ride and that they can go just about everywhere. 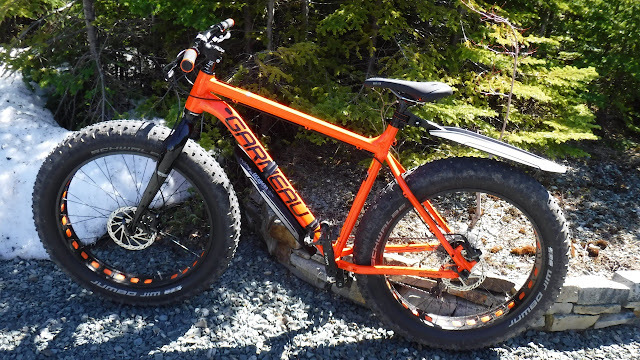 The big fat tires provide oodles of go anywhere traction and tend to kick up a lot of mud/dirt when conditions are prime. While the process of getting fatties dirty is fun . . . the cleanup afterwards is anything but. 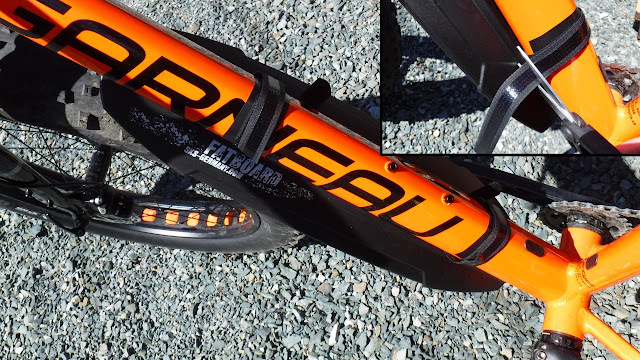 The most common fatbike fender is flexible in nature (DIY) and while it offers protection, the flexibility of the material limits its size and coverage. If looking for increased coverage of a larger fender you would need brackets/support or go with a material that is more rigid. 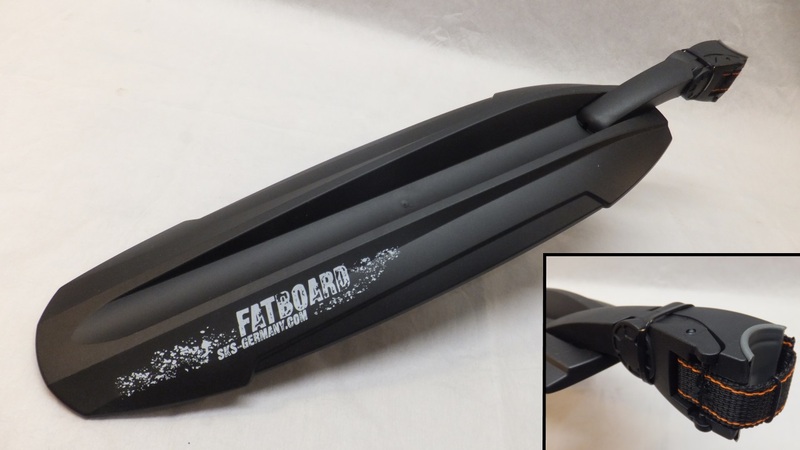 The folks over at SKS Germany design, develop and manufacture all sorts of bicycle fenders including those for fatbikes. Fatbike Republic reached out to SKS Germany who provided a Fatboard Set to review in the wet Atlantic spring. SKS Germany (located in Germany) opened its doors in 1921 making curtain rods. In 1932 the company moved to making bicycle pumps and by the 1980's became the market leader of OEM air pumps supplying 90 countries. 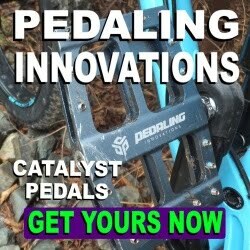 Since 2000 their product line has increased to now include: tools, bags, gauges, water bottles, cages and fenders for on and off road. 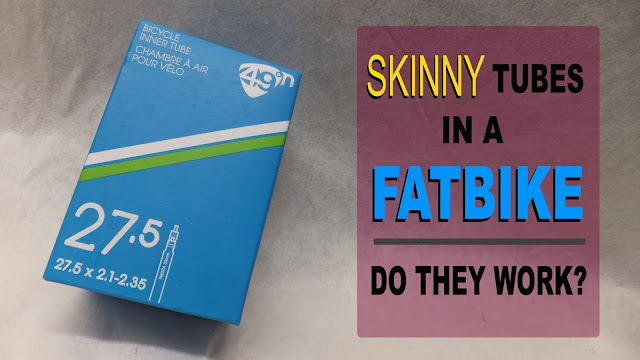 The SKS Fatboard Set includes a downtube fender and a seat fender that are actually manufactured in Germany. They come with a 5 year warranty and the packaging is multilingual showing that these folks are a global players. 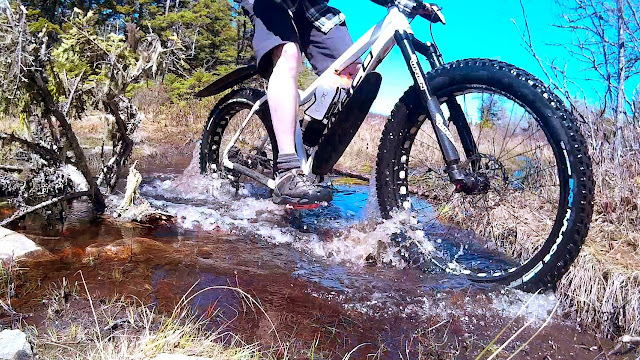 Picking up the fenders its immediately evident that they will not go flopping around like flexible fatbike fenders. 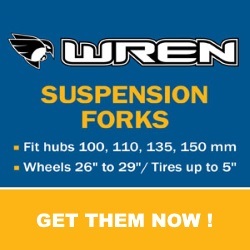 They are manufactured from polypropylene which is a very lightweight and tough structural plastic. 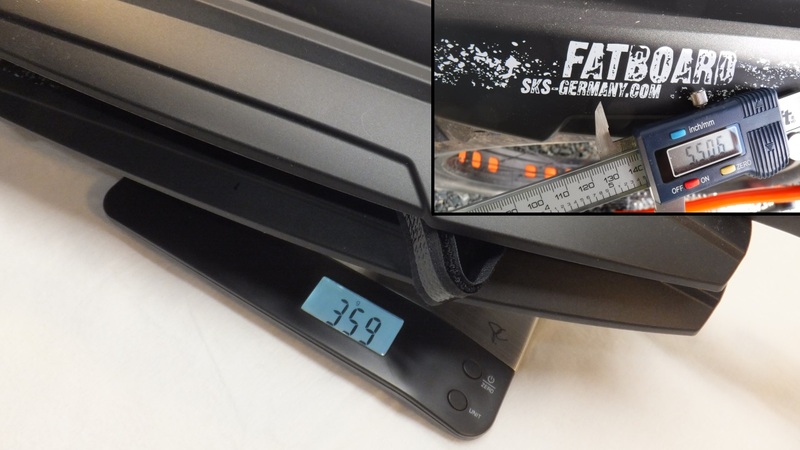 SKS Germany claim a weight of 353g for the Fatboard Set and when dropped on the scales they weigh in slightly heavier at 359g. However, the measurements are spot on at 5.5 inches wide and 18.8 inches long. Lots of mud coverage. Taking a closer look at the downtube fender you will find two premium velcro straps that will attach it to the downtube. Two V-shaped rubber capped mounting points make sure the fender will not move and minimizes any possible paint marring. 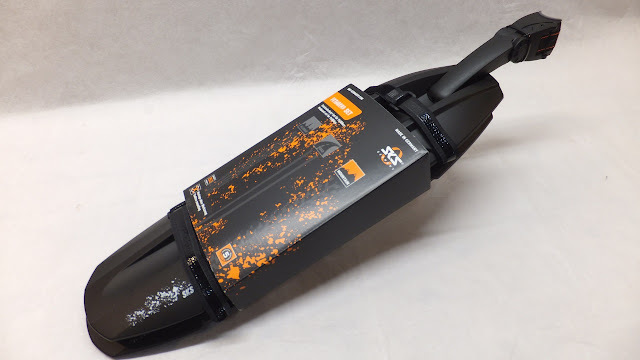 And for those folks who have fatties with cables running underneath the downtube, the cable can run in the V and thereby not interfering with the Fatboard placement. I was curious about the divot and hole in the end the fender so I contacted the folks at SKS who informed me that they use the same fender for the seat and that hole is the mounting point for the arm. Makes sense. Installing the downtube fender is quite simple. 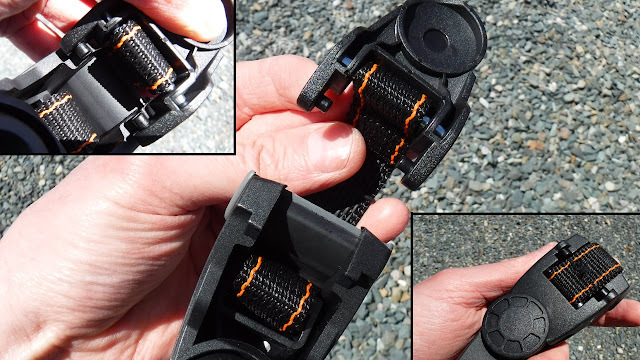 Place the fender in the preferred location, lay the velcro strap over the top of the tube, run it through the buckle, and then pull it tight and secure. The strap is extra long and is easily trimmed. Although not necessary, I placed a couple of strips of electrical tape on frame under the strap to further protect the paint. The seat fender is the brother of the dowtube fender and attaches to the bike via the seatpost without any tools. The folks at SKS call their attachment system a Quick Release Powerstrap. 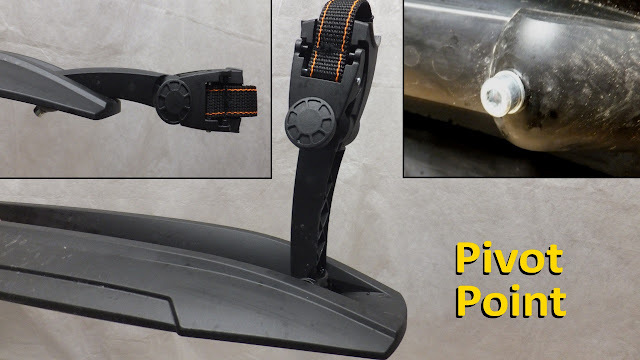 The fender is adjustable horizontally (on the seatpost), vertically (using the hinge on the fender arm) and leveled with pivot point on the fender. 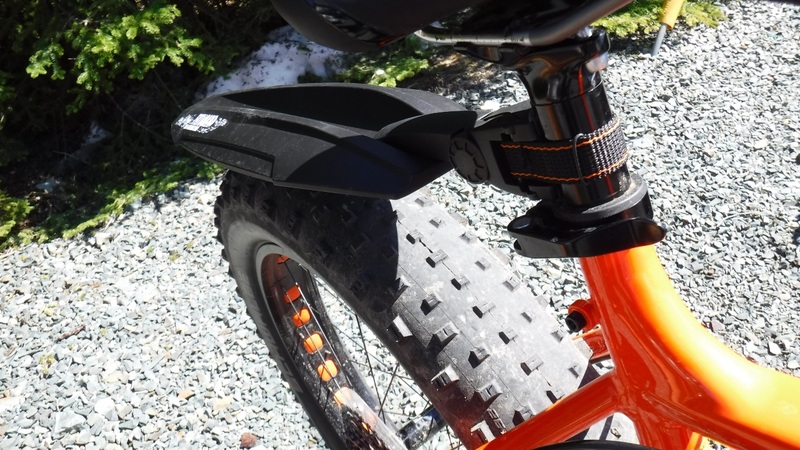 This allows the fender to be tailored to any fatbike. As the seatpost clamp is a universal fit it can be easily swapped between bikes. And the rubber coated mounting point minimizes horizontal movement. Installing the seat fender is also quite simple. 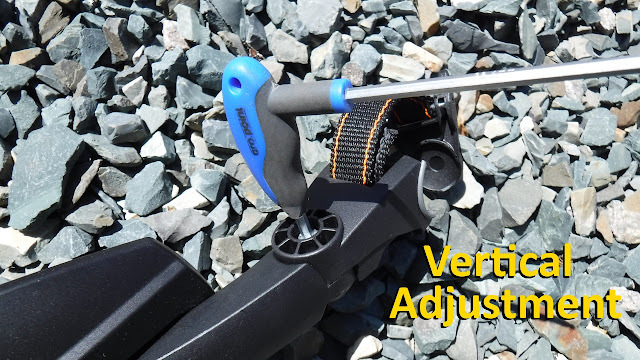 The adjustable web nylon strap (connected to a cam-lever) wraps around the seatpost clamping back into the head of the fender arm with a solid "snick". Removal is a one finder operation involving flipping open the cam-lever from the head of the fender arm, thus releasing the nylon strap. 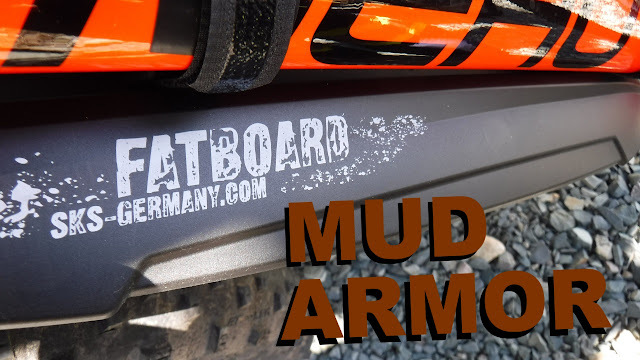 With the fattie encased in mud-armor it was time to hit the trails to see how the Fatboards would react to the 5" Jumbo Jims and 4" Vee Snow Avalanche. 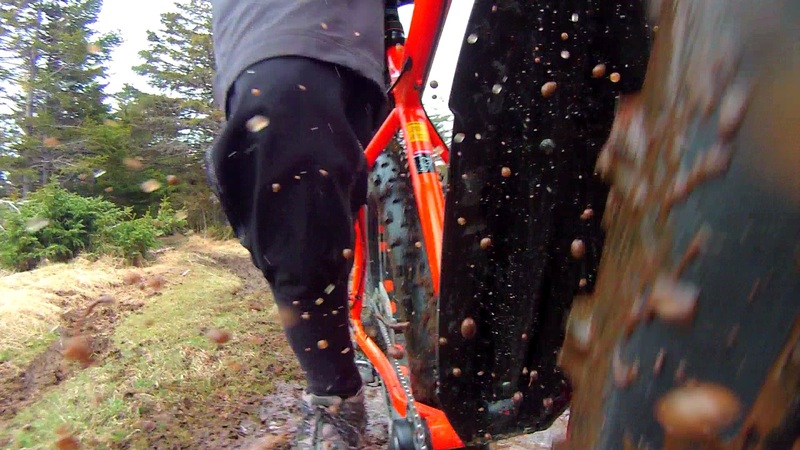 The downtube fender was quite successful in deflecting/capturing mud and water from the front tire. 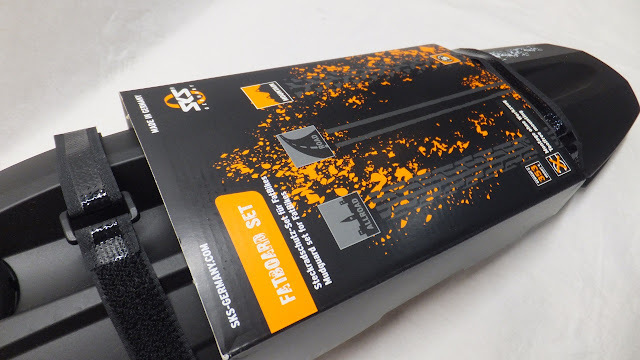 This kept my legs and lower portion of the bike pretty clean. Not only did the fender take care of wet stuff . . . is was also quite useful in deflecting sand and small rocks. 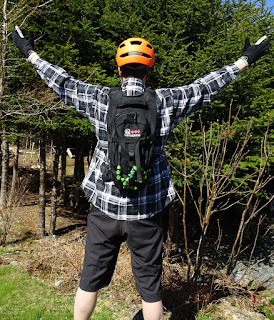 While riding some groomed multi-use trails, at times I could heard the steady pelt of small rocks against the fender. 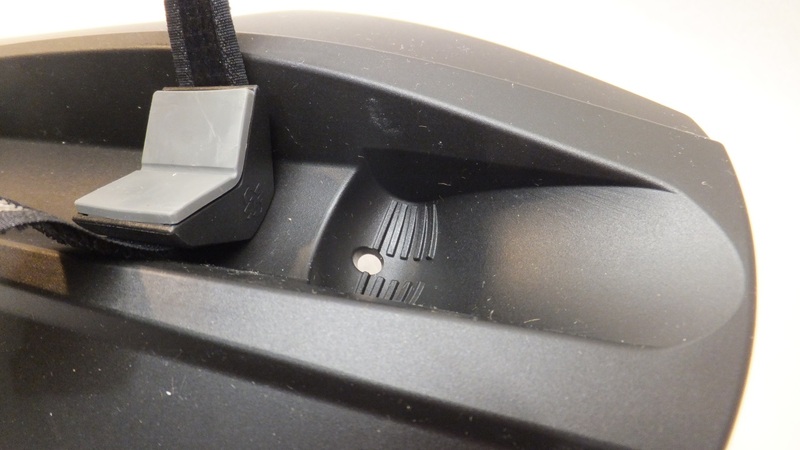 The velcro straps and rubber capped mounting points kept the fender from moving. The long rear fender was much more successful in keeping things clean than the short flexible fenders that mount to the seat stay. 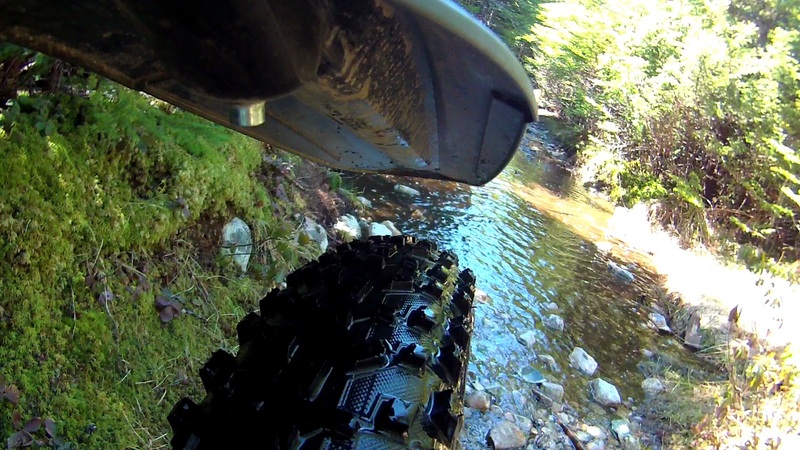 With the two adjustment points (arm and fender) you are able to have the fender hug the tire in wet terrain . . . or allow a little more space for when mud gets chunky. 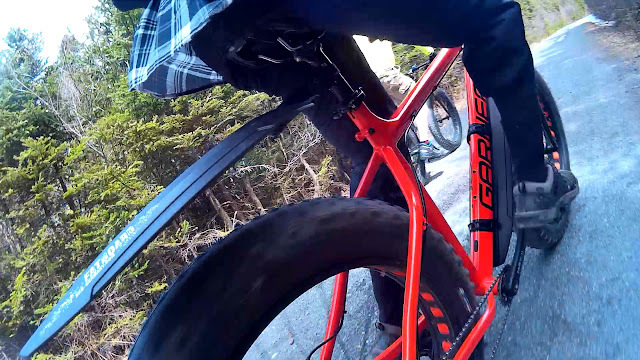 In everything but the most ambitious (bouncy) riding the fender would stay oriented over the wheel. If it did move, lining it back up with the tire is super simple by releasing the cam. 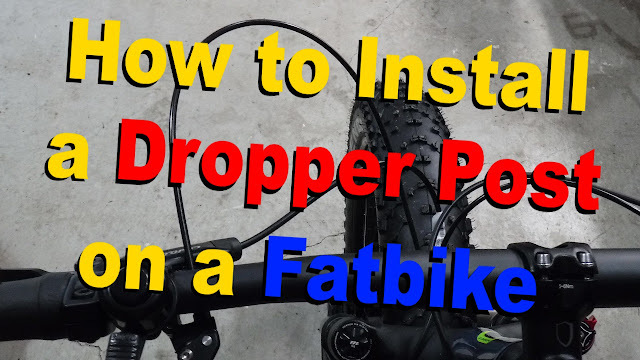 A good downtube fender will keep your legs clean, grit out of your teeth and lower part of your fattie needing less washing. A successful rear fender will stay in place and keep that dirty mud stripe off your back. 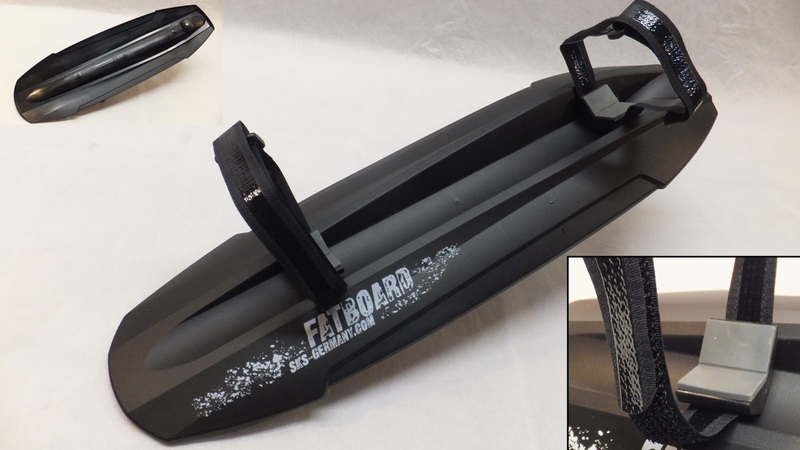 The SKS Germany Fatboard Set is a well though out set of fatbike fenders that mount up super easy without tools. 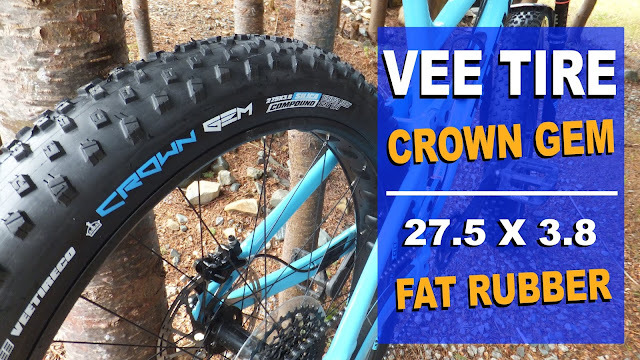 They are tough and can be tailored to your specific fatbike geometry and work with both 4" and 5" tires. And they are easily removable when conditions no longer warrant mud armor. If looking for a little more mud (and stone) protection be sure to check out the SKS Germany Fatboard Set.